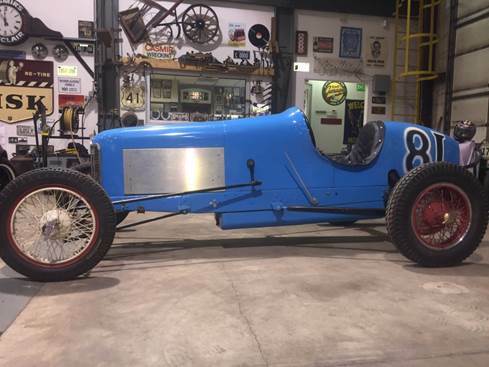 Blue Car--Early flat tail race car purchased from Doc Bowles in New Jersey. Doc claimed it was a Langhorn car with some history. 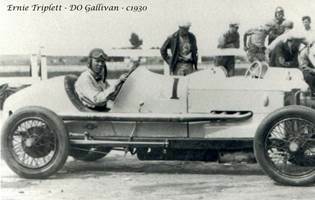 My plan was to install a Model T based Gallivan twin cam engine with a Model A transmission with an on board starter and replicate Ernie Tripplett's D.O. Gallivan championship car. I have a ton of money in the D.O. Gallivan Engine & transmission set up. It has a Model T block with a full pressure A crank, 2 stage dry sump oil pump, water pump on a side drive with magneto mount, Fronty type oil pan which allows the use of a Model A bell housing to use a Model A sliding gear transmission with an on board starter. I also have a more appropriate 1928 Ford multi disk set up with an in and out box, but this set up would require the car to be pull started. 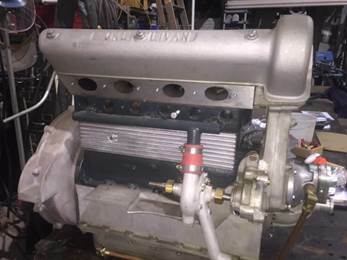 The engine is new and was put together by Dave Szumowski who stands by his work. The head castings were from the original Rajo/Gallivan patterns which I owned. A similar engine put together by Joe Gemsa in my hillclimb car has won every race it has been in, set records, and has been banned from competing at the Newport, Indiana hillclimb because it is "too fast."